Well, I like Adblocker but I'm not going to waste time restoring settings and closing a tab every time I start Edge. So I guess I'll just be going to Ublock. Sorry, guys. You did it to yourselves. 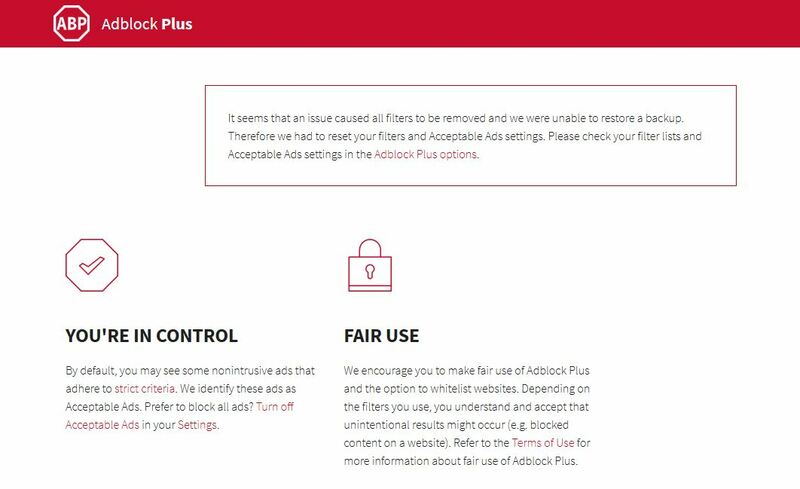 I'll still use AdBlock Plus on Chrome which I use every once in a while and Internet Explorer, which I never use, but Edge is my go to browser and it's just not working correctly there. Auto deletion of cookies is not on. Thanks everyone for the additional details! Please inform us if the tab still pops up after you've closed it. Thank you for your help! Please inform us if the tab still pops up after you've closed it. Thank you for your help!" How about just qa testing your updates before you push them out? this is basic app development 101. Been having this problem for about a week until last night, this is what I done. Click on the three dots top right corner and go down to settings, go down to Clear Browsing Data, click on Choose what to clear, uncheck every thing except Cookies and Saved Website date then click clear, this will remove what I reckon is the problem Cookie, I have not had a problem since doing this. You might have to reload ABP so that it places a new cookie, just remember that this removes every cookie that you have stored. Yep, clearing all cookies and saved data worked. The pop up is gone. This is not a tenable solution. Fix the code in the update, please, and do a proper QA. Petonestamps wrote: Been having this problem for about a week until last night, this is what I done. Click on the three dots top right corner and go down to settings, go down to Clear Browsing Data, click on Choose what to clear, uncheck every thing except Cookies and Saved Website date then click clear, this will remove what I reckon is the problem Cookie, I have not had a problem since doing this. You might have to reload ABP so that it places a new cookie, just remember that this removes every cookie that you have stored. I would love to try this but absolutely hate deleting "all" my cookies to solve the problem of one app. This is not just like "rebooting your PC" to solve a problem, this is more like "reinstalling Windows from scratch" and so inconvenient due to websites now not "remembering" who I am. The solution should be a "targeted" way to eliminate the bad cookie, not having to "reset everything" all the time. I tried the workaround, it does not work. I've had to uninstall it until it is fixed. Clearing Cookies and Cache fixed the problem. At a high price, however.